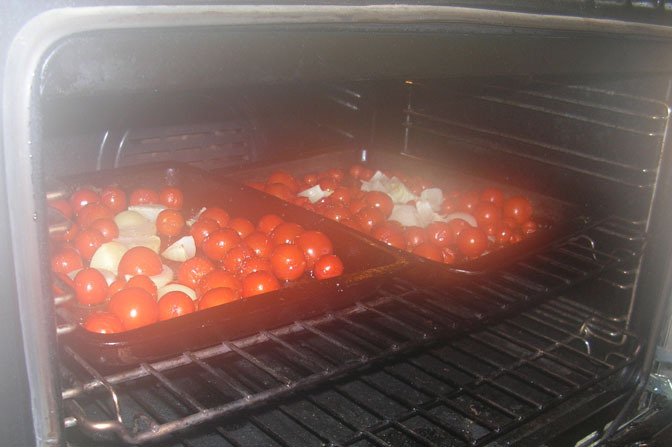 I’m smelling warmly roasting tomatoes, nearly ready for making a pasta sauce. They are a mix of tomatoes we harvested during the week and some excess bought over last night by one of our friends. It’s Sunday morning, the day after we had 10 friends over for dinner, TB is out for coffee with friends so I’m free to doodle around the house and garden by myself. Out the front I’m looking at the ‘three sisters’ bed. The corn is dead, the butternut pumpkins are ready to harvest but the scarlet runner beans have somewhat perversely decided to put on a last burst of growth as the weather has started to cool down. 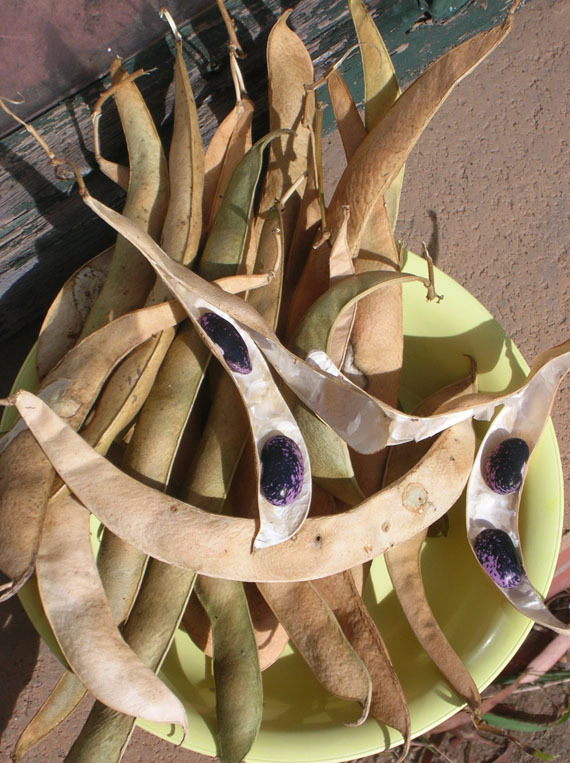 Not to worry I can at least harvest the earlier pods which have now completely dried. I can’t wait to pop them open as I know they will have brightly coloured beans inside. 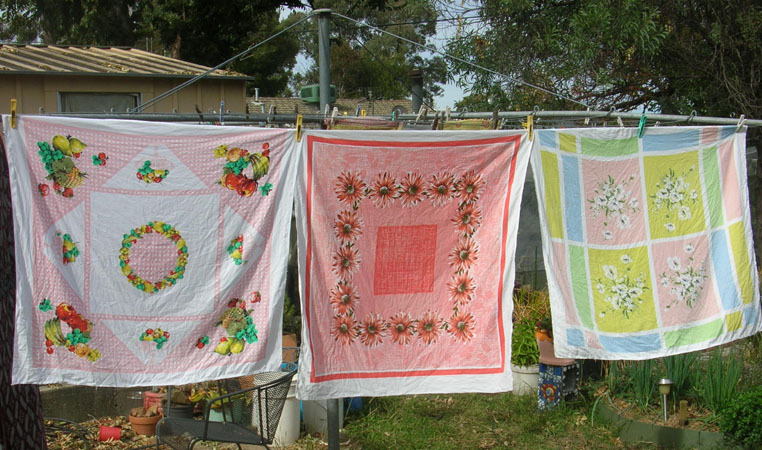 I’ve also put the tablecloths through the wash and I am deriving no small amount of satisfaction from seeing them drying on the line. These three classic beauties were all bought at op-shops in Adelaide (the middle one I scored only two weeks ago). I’ve even sat down with a cup of tea (well two) and a left-over piece of dessert to catch up with last night’s episode of Gardening Australia. The tomatoes are nearly done. 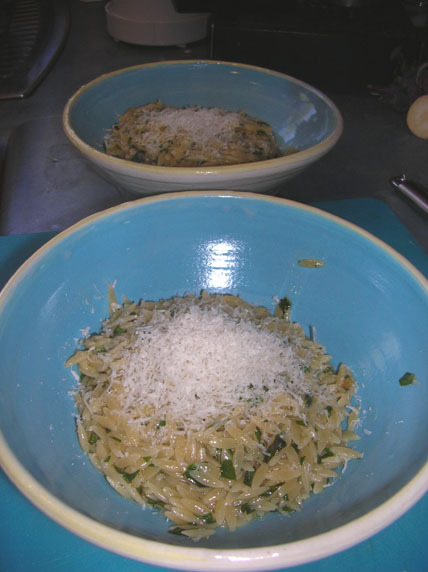 I know this post is somewhat chronologically challenged, but I did want to mention one of the simplest dishes I have cooked and enjoyed recently – orzo with parmesan and basil, it’s more a set of directions than a recipe. You see when we heard that the weather forecast for last Saturday night was a low of 0° we dashed outside to gather our basil before it could get frosted. So come Sunday morning we had a lot of basil to use. The house smelled of the basil we oven dried and we already had stocks of pesto in the freezer, hence a Sunday lunch of basil pasta. 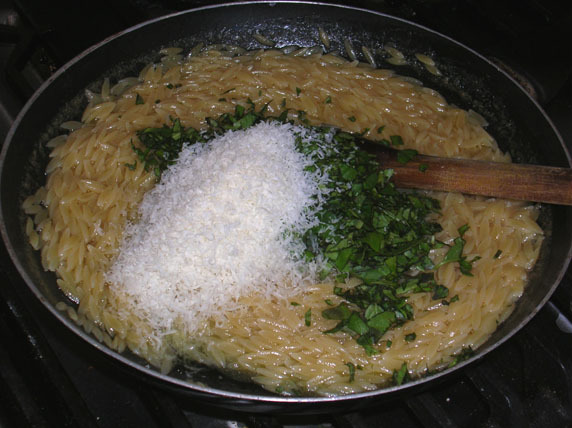 The orzo – pasta which looks like rice grains – was sauteed in butter. I think my 2 tablespoons was rather generous as the pasta was swimming rather than sautee-ing. 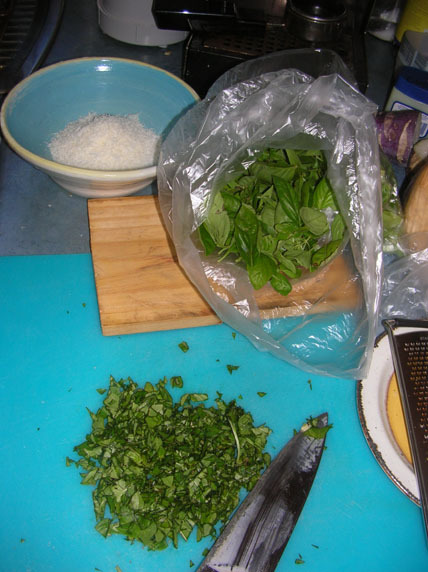 Having added the parmesan and basil leaves all that was needed was a quick stir and we were ready to eat. Simple, but tasty, just right for a lazy Sunday lunch. Last night we saw the new French Film Haute Cuisine courtesy of some free tickets from the SBS Food website. As you may gather from the title it is a food about French cooking, at the highest level, in this case cooking for the French President at the Elysee Palace. 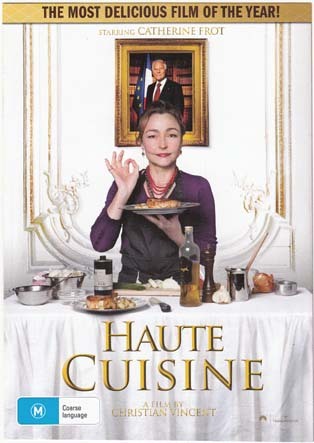 The story is based on the life of Danièle Delpeuch (depicted by actress Catherine Frot) who was the private cook for President Francois Mitterand. The food that is cooked for the President is ‘cuisine bourgeoise’, the best quality of produce cooked in a straightforward manner. 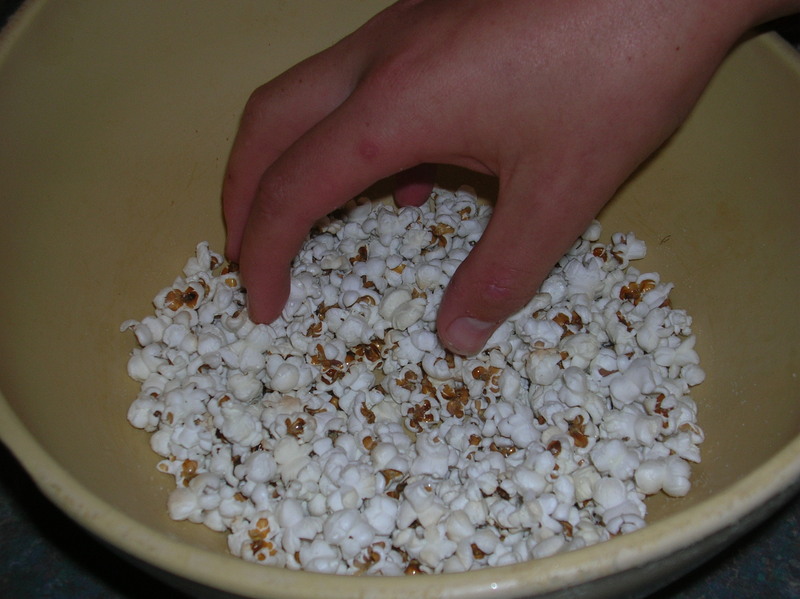 Not surprisingly, the food in the film is presented beautifully, served on magnificent crockery and lovingly detailed. By the end of it all I was feeling quite full. The story stays pretty much on the surface of things and lacks the somewhat deeper themes of similar offerings such as Babette’s Feast or Tampopo. However it is an enjoyable offering, particularly when you can sit back in the cinema with a glass of wine or a good cup of coffee, as you can at the new Palace Cinema, in the Nishi Building. If you would like to hear an interview with the real Danièle Delpeuch you can find it here. Haute Cuisine is screening in cinemas from 25 April. 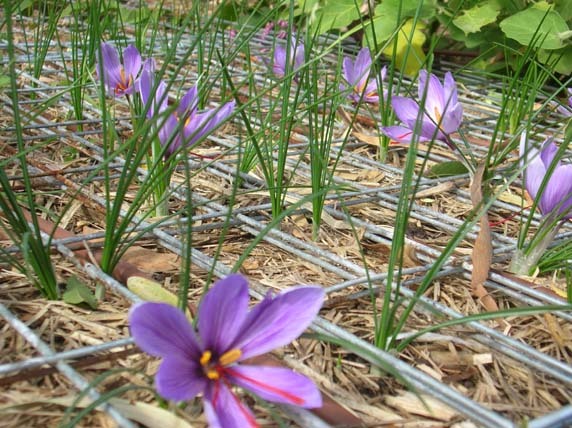 If our apple harvest this year was on the small size our saffron harvest is our best yet. Today we picked 12 flowers, OK it doesn’t sound a huge amount but it is more in one day than the rest of our harvest so far this year. And if your wondering if the steel mesh is some advanced planting system – it’s not – it’s just there to stop our cat digging the garden bed up. If you haven’t seen saffron flowers close up the red part of the flower, the stigma, is the part which you use in cooking. Each of these has to be carefully removed by hand and then dried before being used. 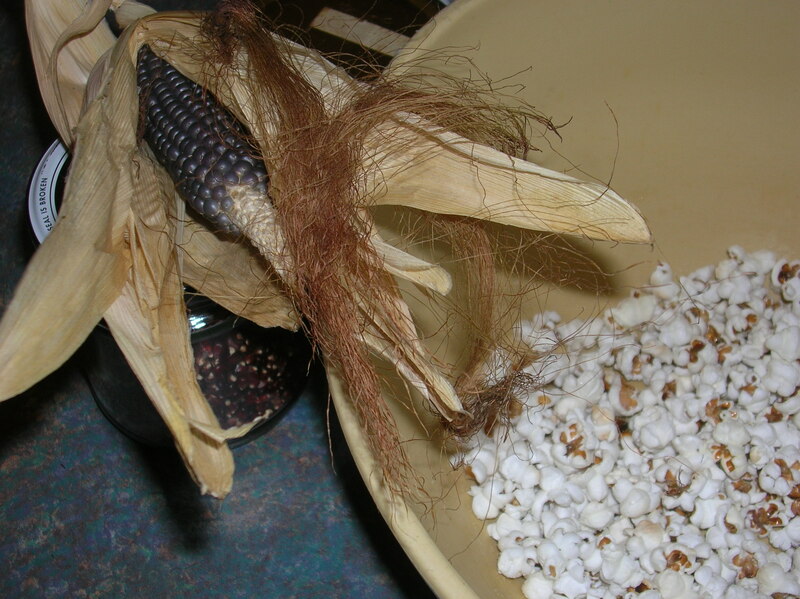 This is today’s harvest ready for drying. For such an expensive spice it turns out to be as easy as pie to grow in Canberra. Our climate of hot dry summers and cold winters seems to suit them just fine. We got our original 10 bulbs from Greenharvest in March 2009 (I’ve also seen them in Bunnings), and they have been multiplying every year since. This year we have over 200 bulbs, of which TB estimates that there were 40 bulbs that were sufficiently large to produce a flower. The rest we have planted out to keep growing to flowering size. 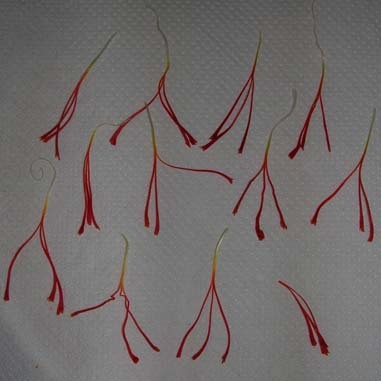 We estimate that our harvest this year will amount to about 2 really good pinches of saffron, sufficient for flavouring two dishes or maybe three. 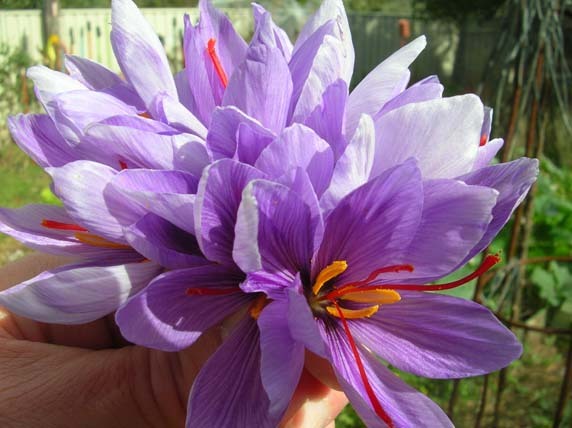 Crazy perhaps, but for the smell of the fresh saffron alone (and perhaps the price of the purchased spice) I think this is one plant that is well worth including in your home garden. On 30 September 2008 I recorded the planting of 5 new heritage apple trees in our garden. Today we have eaten the first apple from those trees. This is a Braeburn apple. 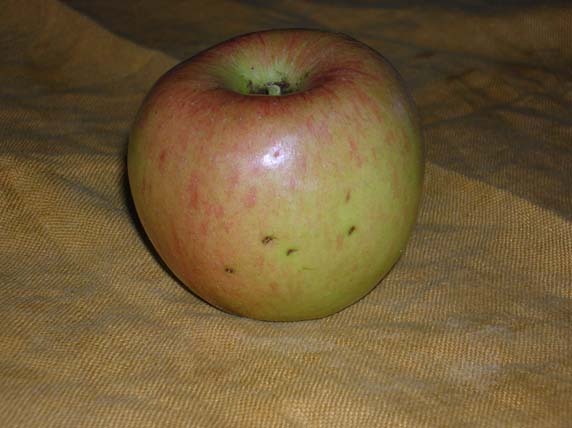 The Braeburn is believed to have been discovered as a chance seedling in 1952 by the farmer O. Moran from Waiwhero in the Moutere Hills near Motueka, New Zealand. It was cultivated by the nursery Williams Brothers to export this variety of apple. It is thought to be a cross between Granny Smith and Lady Hamilton. The apple itself is named after Braeburn Orchard where it was first commercially grown. (source Wikipedia). To be precise this is the only apple that we have eaten from any of our trees, because it is the only apple to have survived that far. We almost had one last year, but something, we think a possum, nabbed it just before we could. To be fair our apple trees have had rather a tough time of it. They are growing along our back fence line and suffer from regular neglect. Perhaps the best thing that has happened recently is that two of them got incorporated into the chook run so they do get more regular water when I empty out the chook’s water bowl. The original five trees included, in addition to the Braeburn (1952), a Stayman’s Winesap (1866), a Golden Delicious (1905) and Granny Smith (1868) and a now sadly departed Cox’s Orange Pippin (1825). Since then I’ve also bought a Kingston Black apple (1900) which is a special cider making variety. I think it will be some time before we get any cider out of that tree! 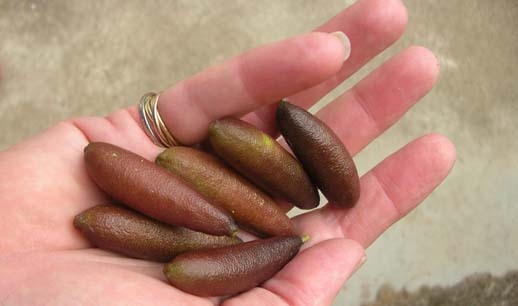 One of the most exciting crops in our garden this year is our Australian Finger Limes. I’m growing Citrus australasica, var. 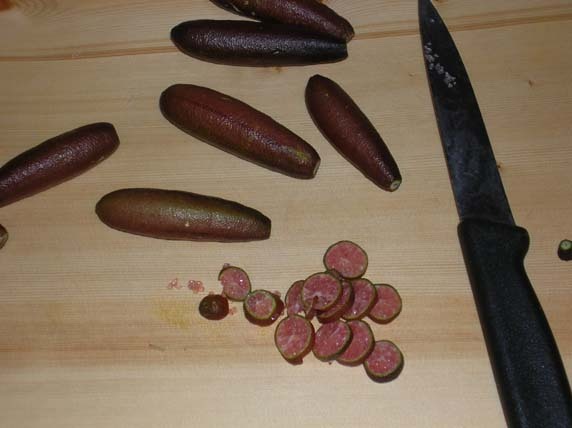 sanguinea’ Rainforest Pearl’. This is one of the varieties of native citrus that has been developed commercially over recent years. As this plant doesn’t grow naturally in the Canberra region we have been growing it in a pot so we can place it under the shelter of our trees in winter. It survived last years frosts and below zero temperatures to produce what I think was quite a bit of fruit for a still small (about 1 metre tall) plant. Indeed I pulled off about a third of the fruit that was initially on the plant. Apart from the interestingly shaped fruit, this plant has very sharp spines! 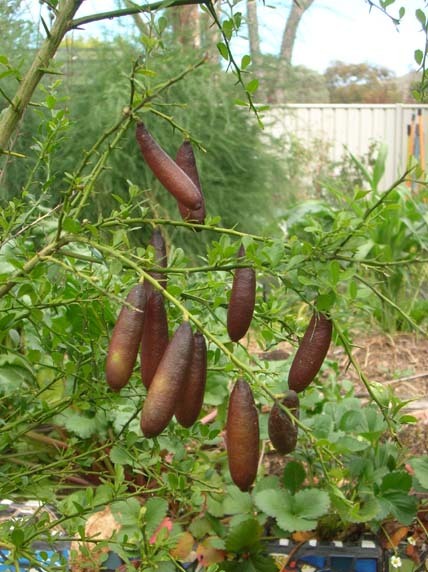 Like many native plants the finger lime has intense flavours. So you don’t need much to give any dish some real tang. I made some wonderful, marmalade with finger limes and Tahitian limes a few years ago, so I was prepared to have another go, albeit with a slightly different twist this year. I used Liana Krissoff’s recipe for Strawberry & Lemon Preserves (in Canning for a New Generation) and substituted a handful of finger limes for the lemons. I had strawberries in the freezer so that part was straight forward. 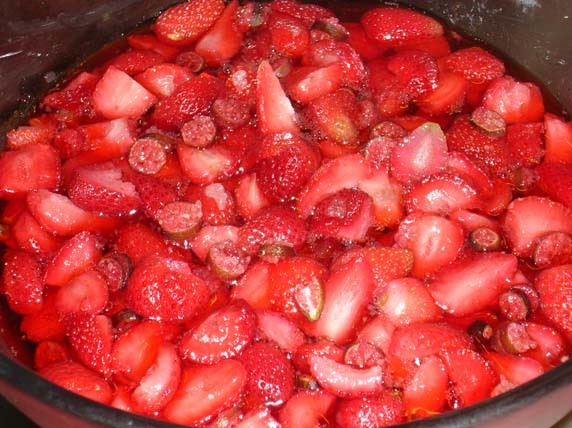 After cutting up the fruit and macerating it with sugar overnight I had a delightful bowl of deep pink fruit. 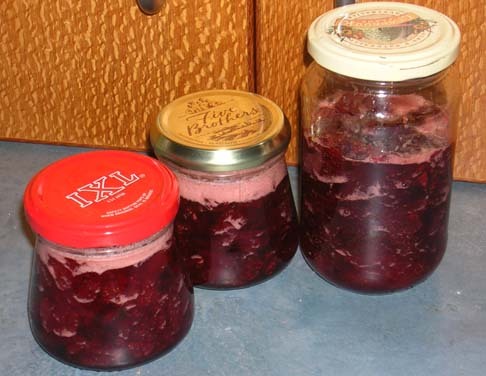 From here on in it was basic jam making. It turned out not to make such a large amount and I chose to be contrary and not skim the foam off my jam (because it was such a small amount), hence the pale pink ‘froth’ (now somewhat solid) on the top of my fruit. I’m looking forward to tasting it during this week.